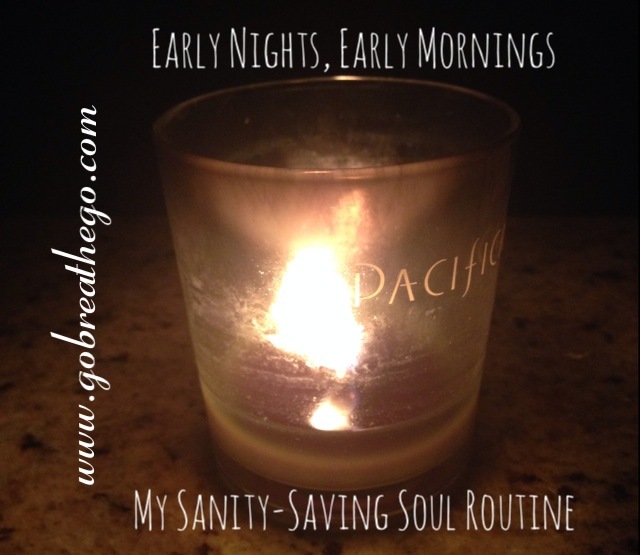 Early Nights, Early Mornings – Homeschooling in the "D"
I’ve been waking up at 6 AM for the past few weeks, and while it’s been helpful, it hasn’t given me the early morning quiet, alone time I need. That’s probably because, for some reason, my oldest sun seems to have radar that is triggered by my getting up at 6 AM. He thinks that when I’m up, he needs to be. Ummmm… no. So, today I naturally woke up at 5 AM today and have had a whole hour, let me repeat A WHOLE HOUR, in peace and quiet by myself. This I could get used to. To do this I had to go to sleep early, like at 9 PM. These days it’s not too hard because with being pregnant I’m pretty much ready to go to bed around 7 PM, but as every mama knows, that probably isn’t reasonable most days. For now, I’m going to aim for a 9 PM bedtime and 5 AM wake time, daily. Of course, to do this some things may not get done at night and I’m going to have to be OK with doing what I can and letting go of the rest. My soul needs this daily quiet time. With the new baby coming and things changing over the next two years, I need a consistent way to tap into me without taking too much time away from my family. I will make this work! My plan is to wake, shower, read something inspirational, light a candle, put on some music (in my ear buds of course), make some tea, and write. Eventually I’d like to add in a workout. As for today though, besides thinking I heard the boys wake up 50 times, I actually did all of the things I mentioned, minus the workout. Heavenly, I tell you. I think I may be onto something here, mamas. How do you find time for yourself daily? Share with me. I’ve always been an early riser but never did I appreciate those quiet morning hours than after having children. When my youngest was around 2, I started getting up consistently at 5 AM. I’d journal, read inspirational books, meditate/chant. I initially did a practice called 5/5/5, read for 5 minutes, pray/meditate for 5 minutes and then write for 5 minutes but then I started adding more and more time. Eventually, I’d do this things for 45 minutes to an hour every morning. Then around 6 AM, I’d exercise. If you’ve ever read my blog, you see that I was frustrated a lot with the exercise because just like you, my son, it seemed, could sense that I was awake and he’d coming into the room where I was and want to nurse or be held. Often my exercise plans were foiled. But he got older and stopped doing that and eventually I got myself into really great shape right there in my living room. It was during that time too, that I was most active with my blog. Having three children right now and having experienced some changes in my household, I find that I need to leave the home in order to get some me time. Some mornings I stay home and read, crochet, write but I always feel nervous that someone will wake up or I feel like I need to be doing things around the house (laundry, cleaning, etc). This morning, in fact, was a case in point. So I get my me time at the gym and I really enjoy it. I sometimes meditate there. I do miss consistent quiet times at home though and I hope that at some point I live in a house with maybe a very separate area or a separate cottage to where I can retreat. So you know my pain? SMH. Both boys woke up before 6 am this morning and I was not happy. Hmph! I guess this just comes with the mama territory. And I will definitely get with you when it’s workout time. Sis. Thanks for the offer!